Today I decided to take a trip way, way back and watch some Patrick Troughton. Every time I watch one of his episodes, I’m reminded of just how much I like him. Troughton’s Doctor is so much more frantic and fallible than some of the later incarnations. There’s never any doubt that The Doctor cares about his companions, but in Troughton’s case, that care is right at the surface. No suave posturing for him, he doesn’t hide the anguish he feels when his friends are in trouble. 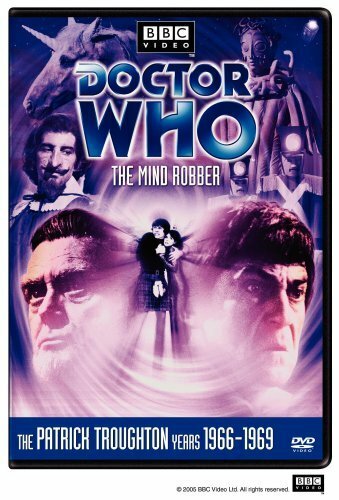 This is particularly exciting for me because I’m pretty sure I’ve never seen The Mind Robbers before. There’s no way to be sure; I’ve been watching Who since before I can remember, but I don’t recall this one, so it might as well be new. My first impression is that this episode was a real budget-saver. There’s some stock footage of a volcanic eruption (which they escape by engaging the TARDIS’s emergency unit to take them out of time and space as they know it). Other than that, the sets pretty much consist of the TARDIS control room and a plain white fog. Well done on the cheap! The sparse sets don’t detract from the episode at all though. I rather enjoyed watching Jamie and Zoe wander through the fog. I’ve done that, and it’s eerie not being able to see more than a few inches in front of you. Their fear is totally understandable. (Boy, I’d forgotten what a screamer Zoe is!) I can’t say much about the story yet, only being one episode in, but so far, I’m really enjoying it. I watched Tomb of the Cybermen a few months back, and felt it was kind of slow and stilted, but this episode sucked me in immediately! I look forward to Episode 2. As for the knitting, it’s coming along smashingly. 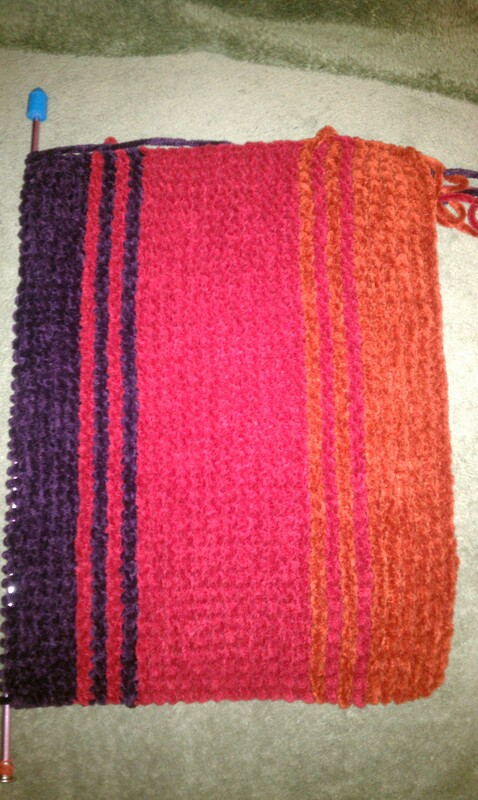 I’m working on the mini-stripes between the first purple and second orange stripes. I haven’t come far enough yet to warrant another picture though. Perhaps when I’ve finished the next “real” stripe. I can’t remember if I mentioned where I got the pattern already, but in case I’ve neglected it, I’m using the season 18 pattern on DoctorWhoScarf.com. I also regularly visit wittylittleknitter.com, where Tara Wheeler has some wonderful videos of how to do the orange crochet trim! I should point out that the patterns on both sites are identical, so I guess you could say I’m following either one. The former suggests slipping the last stitch as if to knit (per the official BBC instructions), but the latter says to knit every stitch. I’m with Tara on this one, and I’m knitting everything. Really though, both sites are fantastic, and I highly recommend checking them out if you’re interested in the Who scarves. There’s a lot to know! If you haven’t ready yesterday’s post (Thursday, April 28th) about Bruce Campbell playing The Master, you should go do that now. Go ahead, I’ll wait. So I admit it’s not much of a victory. Bruce Campbell as The Master? It pretty much screamed unlikely. In capital letters. (Yes I just said screamed in capital letters. Sue me.) But I did indeed get confirmation last night that it was, as I suspected, a hoax. My friend’s associate at the BBC was simply having a laugh at my friend’s expense. I’m not sure what would posses someone to craft that particular joke (it wasn’t even very believable), but heck–it spiced up my day a wee bit! And really, there’s some serious value in that these days. So thank you crazy hoaxter lady from across the pond. Here’s hoping today is as interesting. But perhaps in a less ridiculous and more oh-my-goodness-I’ve-just-won-the-lottery sort of way. Bruce Campbell as the Master? Ok, so I haven’t been knitting, but I felt compelled to comment on this. A friend (who shall remain nameless) called me this afternoon. She was all in a tizzy ’cause she’d gotten some rather interesting tweets from a few friends who work at the BBC. Apparently the word on the street (or across the pond) today was that Bruce Campbell is slated to play The Master. Anyway, back to the rumor mill. I’ll tell you straight out: I don’t buy it. I truly don’t believe that they’d go with an American actor for the Master again. And much as I love Bruce (and I LOVE Bruce), I’m glad about that. The Master works best as a quintessentially British villain (to steal a phrase from a friend and fellow Whovian). Ok, so I’m doing this a little bit late. I actually started writing this blog over a month ago. I just didn’t get around to putting it up here on the intarwebs until, well, just now. So I suppose I’ll just include all of my previously-written entries here for your edification (or possibly your boredification–but I hope that’s not the case!). So please, if you feel like it, read on! Hello internet! Is that the appropriate way to start a blog? It’s been so long, I’ve plum forgotten. So, my plan is to watch the adventures of the good Doctor while I create the scarf, and write about the episodes in addition to the knitting process. That way the blog won’t be entirely geared toward knitters (most of whom probably don’t care about Doctor Who). Instead, it’ll also include info for Who fans (most of whom probably don’t care about knitting). I’ve now got the yarn, so I’m ready to start the preliminary stage—checking guage. I really hate checking guage, but I’ve been knitting long enough to know not to skip it. So I’ll chronicle that painful process next time. I’ll have to pick an episode I love enough to balance out the pain of the knitting. Oh thank Christ! My gauge is right on the first try. I am so pleased I don’t have to do that all again. Looks like I’ll be using size 6 needles. Incidentally, they’re the very same needles I used to knit the season 12 scarf several years ago. I’m sure they’re thrilled to be back in service to a Who scarf. I know I am! As for what I watched while “gauging,” well…I didn’t. I know, I know, I said I was going to watch the show while knitting, but today I listened to episode #243 of the most excellent podcast Radio Free Skaro. If you’re a Doctor Who fan and you’re not listening to Radio Free Skaro…well you should be. Episode #243 (Five Rounds Rapid) is, in great part, a tribute to Nicholas Courtney (who played the Brigadier). It features an excellent interview with Gary Russell. Courtney passed away on February 22nd, leaving the world a little emptier and a lot sadder. I started watching Inferno the week that Nicholas Courtney died. I thought it was a fitting tribute, seeing as how he not only got to play dual roles, but played them both pitch perfect. Gosh he looked like he was having fun playing the Brigade Leader in the alternate universe! Anyway, Inferno is a six-parter, and I simply got too sleepy to finish off the episode. Tonight I watched part 5 before calling it a night. That means I still have the thrilling finale to look forward to—and look forward I do! I’ve owned Inferno (on antiquated VHS) for well over a decade, and I’m ashamed to say this is quite probably only the second time I’ve watched it. Bad Erika! I’ve never gravitated to the third Doctor’s era, so I tend to find myself choosing a (Tom) Baker or Davison episode by default when I’m in the mood for some Who. I need to work on that. Pertwee’s Doctor might be a little more brusque than the quirky-go-lucky fourth or the fecklessly-charming fifth, but he’s got that deeply ingrained sense of honor that’s present in every incarnation. And he wears it right out there on his frilly sleeve, for everyone to see. Yes, he’s prim, proper, and purposeful but he’s all those things for the very best of reasons. I find I need to reacquaint myself with this fellow. I’ll have to scour the Netflix instant queue and see what other Pertwee episodes can be found. I’m also open to suggestions! As for the knitting, I spent most of the short part 5 getting things organized, and pulling out the stitches of the swatch I’d used to check gauge. So I only got one row actually knitted. And the jury’s still out on whether I’ll even leave that in. I was debating doing some sort of fancyish cast-on, but I’ve misplaced my favorite knitting tome (the Reader’s Digest Knitter’s Handbook). So for tonight, I just did a basic cast on, and I’m going to sleep on whether to go with it or to backtrack and start over. I just wish I knew where that damn book had gotten to! Well it’s been nearly a month, but I finally continued on with my knitting project. I’m starting to wonder it it’ll ever make it to the internet. I still haven’t found a suitable intarweb location. (Ok, actually, I haven’t even tried yet.) Anyway, in the intervening month, I forgot that I was debating what to do about the cast on, and I simply continued knitting. I’m ok with this because I’ll be adding tassles to the finished product, so the cast on isn’t really all that important. I’m starting to re-think my original intent. Perhaps I should branch out and knit during shows other than Doctor Who. Don’t misunderstand me, no other show can compete for first place in my heart. But I have a lot of other things I’m trying to keep up with, and I would like to get this scarf finished this year. Perhaps even in time to wear it for winter (although that seems like a too-ambitious hope). I suppose I’ll continue to mull that over while I think about when and if I’ll ever migrate this “blog” from my hard drive to the world wide web. Ah, the final episode of Inferno! I’ve finally finished it. And it only took me a couple months… Hey, better late than never, right? Anyway, I enjoyed the episode and the knitting that accompanied it. I finished the first stripe of 10 orange rows and did the first row of the burgundy/ruby color. Things always get more interesting when switching colors. Of course, the lighting in my living room is such that I can barely see the difference. I trust that under the winter sunlight, it’ll be much plainer. I think I’ll leave this entry short. I’ve been sick with the flu for about a week now. Today was the first day I had enough energy to sit up this long, let alone knit, but I don’t want to push it. Might be time for a bit of a rest. I admit it; I’ve been taking a break from the Doctor. Well, while knitting anyway. I did watch the season 6 premiere on Saturday (no knitting), and The Impossible Astronaut enthralled me so much that I simply couldn’t turn off the tv. Thus I stayed up far too late watching A Christmas Carol as well. A sweet bonus was that my sister and her boyfriend were there, and they stayed up to watch the good Doctor with me. My sis, despite having seen oodles of classic Who, has only seen a handful of new episodes—all Eccleston. Her boyfriend has seen even less. When A Christmas Carol was over, Sis’ fella turned to her and said “Maybe we should watch more of this Who show. That was pretty good.” Victory! More new Who converts! Who fans will notice that I haven’t mentioned anything about the passing of Elisabeth Sladen (companion Sarah Jane Smith) last week. That’s on purpose. I still get teary when I think about it. I’ve never gotten upset at the death of a celebrity before. But this one hit me hard. HARD. Maybe someday I’ll feel up to writing about what a huge influence she was on me, or how much I appreciated having her in my life (even though it was just through the tv set). But today is not that day. I’ve had a couple little sessions and got two more entire stripes done! (Plus the small in-between stripes, of course.) I’ve been working my way through Buffy and Angel (yes, for the first time), and I thought that constituted appropriate alternate entertainment while working on this geeky project. Come to think of it, there may have been an episode of two of The Big Bang Theory as well. I think that still qualifies. So the knitting is coming along just fine. Now I think it might be time for me to actually post this on the internets. Finally. Better late than never I suppose!